Automotive retailers looking for the whole package stop here! 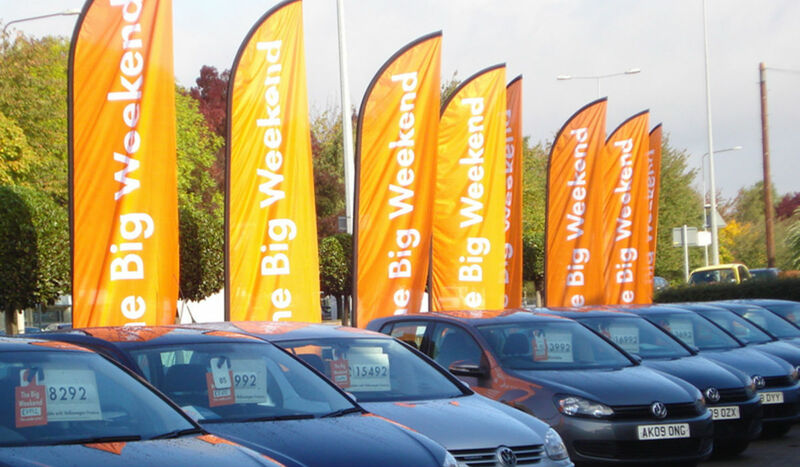 We print everything you need for your forecourt, showroom and the cars themselves. We’ve been supplying automotive displays and signs to car dealerships across the country since we started in 1988. We love working with them because our passion for cars is almost as strong as our passion for print! A lot has changed over that time, not just the look of the cars but the range of printed items used to market them. CSDPrint digitally prints the lot, almost everything you can think of for your showroom and forecourt. It’s not just our super high-tech printing capabilities that keep our automotive dealership clients coming back to us; it’s the whole package we offer – production management, fulfilment and delivery. It doesn’t matter to us if you have just one dealership or a whole network, we take great care. Our team makes sure every item – whether it’s a vinyl window sticker, car roof crowner or forecourt banner – is produced to a superb quality and is collated, dispatched and received on time. CSDPrint is lucky to be working with dealerships selling Mercedes, BMW, Lexus, Ford, VW, Toyota, Land Rover, Jaguar, Audi and Vauxhall cars but we’d love to work for a few more!